The TT180 is a great fit for small shops that perform spot color printing where detail is not a major concern. 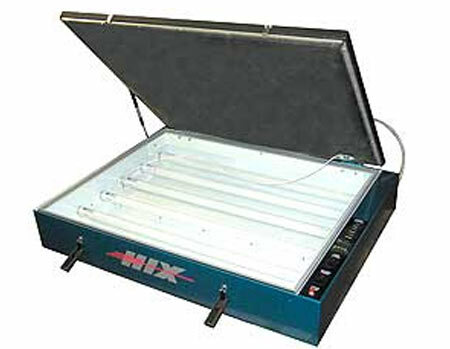 Depending on the sensitivity of the emulsion you use, you can still get fast exposures with the bar lighting system consisting of six high output actinic UV lamps. Light scatter has always been an issue with bar lighting systems, but the deep draw blanket powered by a 115 Volt vacuum pump holds art and screen so tight that any undercutting by light is held to a bare minimum. The digital timer and auto-shut off are standard on this unit which will hold screens up 25” x 31.” Light and compact, this unit can be moved easily in any dynamic work situation. Maximum exposure area: 25" x 31"